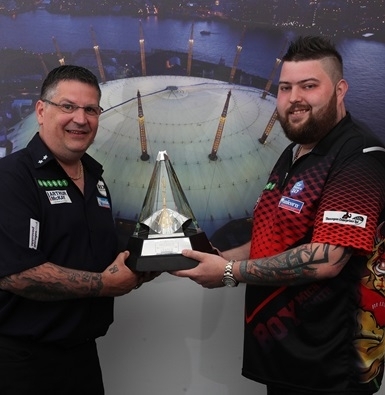 Close friends and Unicorn team-mates Gary Anderson and Michael Smith prepare to go head-to-head in their Premier League clash, with the Scot in familiar territory having qualified for The O2 for a fifth successive year. Two-time Premier League champion Anderson secured his Play-Off spot with a win over Van Gerwen in Aberdeen last week, and the Scottish star knows he will have to be at his best to beat his protégé Smith. “He’s like my adopted son but I will be playing to win,” said Anderson, who recorded a 7-2 win over Smith in their last Premier League meeting in Rotterdam and is 7/2 to claim the title for a third time. “He’s my mate and we get on really well, but it doesn’t matter what game we’re playing I always want to win. “It’ll be great playing Michael on such a massive stage and whichever one of us loses will be there cheering the other on in the final. Smith will also be making his debut Play-Offs appearance, although he has experience of playing on stage at The O2, having won the Unicorn PDC World Youth Championship final in 2013 against Ricky Evans. The St Helens star has enjoyed a memorable second Premier League campaign, which saw him end the league phase in second place, and Smith is now focussed on making Thursday the biggest night of his life. “I believe I can win the Premier league,” said Smith, who beat Anderson 7-5 on the opening night of the season in Dublin. “I’ve won two games in a day against the world’s best players many times before so there’s no reason why I can’t do it again at The O2. A crowd of 10,000 fans will pack The O2 on Thursday to see the tournament’s conclusion, with a £250,000 first prize on offer for the eventual champion.